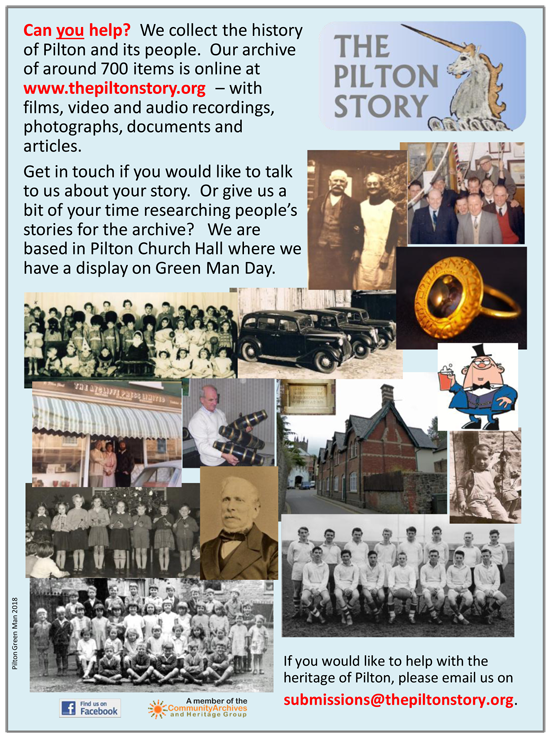 For those of you who need to know these things far in advance, you will be pleased to learn that Pilton Green Man Day 2019 is on Saturday 20th July. As always, this is the third Saturday in July. Please make a note in your diary not to be away and watch this website for more details. For APPLICATION FORMS for Catering Stalls and Non-Catering Stalls click on the sidebar. 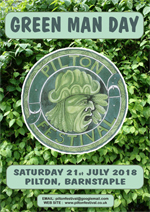 For those not fortunate enough to live in Pilton or go to a Pilton school (and have your own 2018 programme hand delivered by volunteers in the weeks before Green Man Day), please click on the front cover of this year's programme (left) to have a look at what went on over the Pilton Green Man weekend. Thanks to all who came and supported the stallholders and advertisers who contributed so much to making it a great event. Many moons ago Pilton Festival had its own T-shirts and tea towels with the old Green Man logo. You may even still have one. In 2018 the T-shirts were back with a new one colour version of the logo produced by designer Julie Parker. The new T-shirt was available for only £10 (although there were limited numbers). 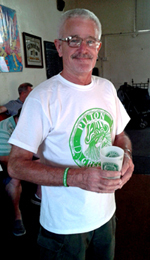 Here Bryn Rees is modelling the T-shirt along with the new Pilton Green Man wristband (50p), and the Pilton Green Man pint, re-usable plastic 'glass' (made in the UK and £1 when you bought a drink at the Green Man Beer Tent or the Pimms Tent). 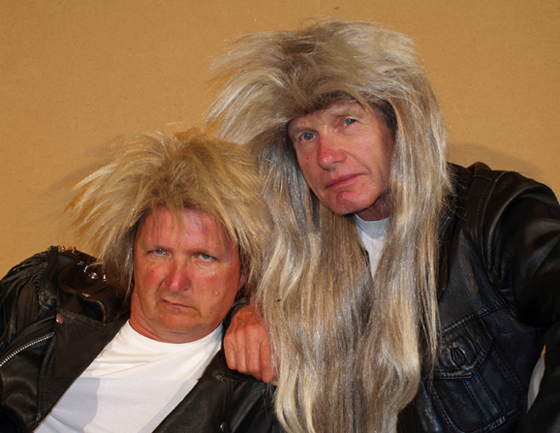 They will be available again on Green Man Day 2019. Pilton Green Man Day is purely run by volunteers. It relies on the profits made by the Green Man Beer Tent and Pimms Tent to fund next year’s event so please come and support them and all the stallholders who have made the effort to join us for the day. If you have never been, have a look below at what happened in 2017 and in our Archive to find out what it was all about in previous years. Scroll through this page to find out a bit about how it went. 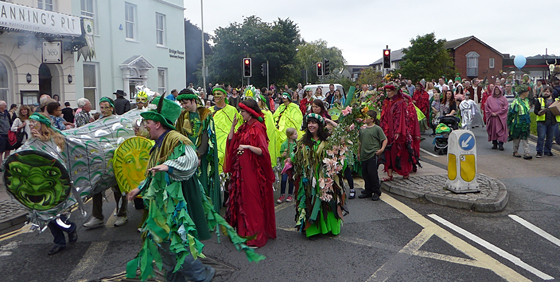 Green Man Day 2017 on Saturday 15th July saw lots of people - where do they all come from? - braving the light drizzle and occasional harder showers to enjoy the market, food, drink, music, activities, parade and pageant, although not necessarily in that order. 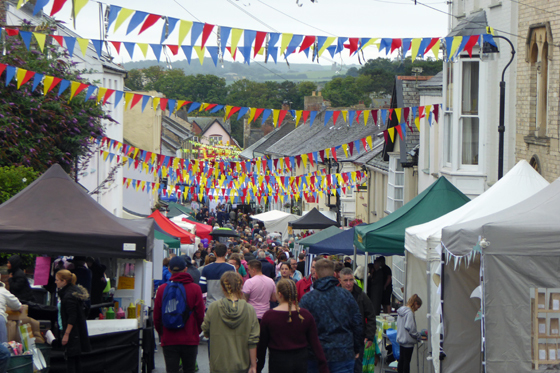 Despite the damp, the Street, which was decorated with some brilliant new bunting by Liz Eveleigh, was as crowded as usual with most people determined to have a good time. And in Rotary Gardens the absence of a few stalls, whose owners had cried off at the last minute through illness, didn't stop everyone making the most of the entertainment. 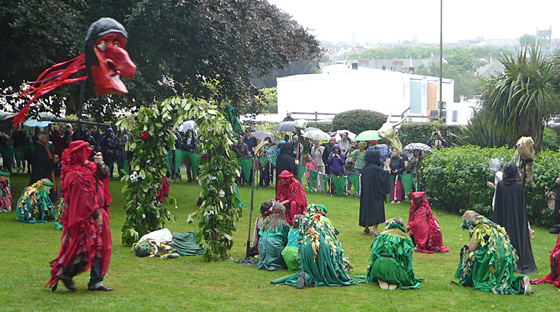 And the Green Man Pageant took place twice as usual in a new arena at the top of Rotary Gardens in an excellent woodland setting. Once the audience had found the new location, it was very well supported and ended up successfully with the message "The Green Man Lives". Thank you to all those who braved the weather and supported Green Man Day 2017. 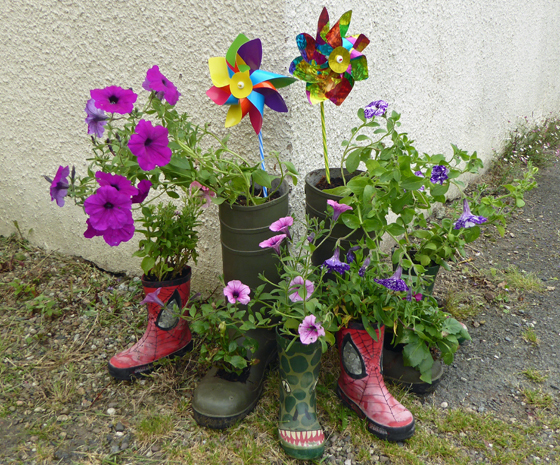 In the run up to the day, Pilton was gradually brightened up with decorated wellies of all stapes and sizes. Click on the image below to see an album of the thirty-odd wellies the Green Man could find. On the Friday evening before Green Man Day, the Who Killed the Pop Star murder mystery in the Church Hall was a great success, challenging fifteen teams to work out who done it! Which one of the boy band Wha-Hey!! (image below - just use your imagination!!!) was murdered and whodunnit will have to remain a mystery if you missed it. And finally, a couple of dozen family groups were relieved to find Sunday afternoon was dry and almost sunny and did the walking Treasure Hunt around the village centre finishing with lots of tea and cake in the Church Hall. It was a lovely calm way to finish the weekend. 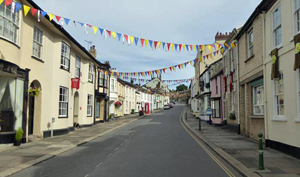 By Monday serenity had returned completely to Pilton Street (left) and by Tuesday even the bunting had gone. Thanks Devon & Somerset Fire & Rescue for a prompt response! That's it for 2017's Green Man Day. Well done to everyone who gave lots or a little time helping in some way to make it a success. A lot of hard work goes into getting it organised, making it run smoothly and then tidying everything away afterwards! It certainly doesn't happen on its own. Help is always welcome throughout the year as well as on the weekend itself. We look forward to meeting new volunteers. Pilton Green Man Day is run by the Pilton Green Man CIO. This link will take you to a page about the CIO or read on for some of the things up to which it is getting. The CIO has started supporting wider community activities in Pilton using profit coming from the annual Green Man Day. 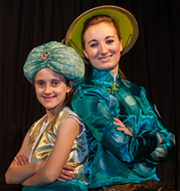 It has already supported the Pilton Panto and The Pilton Story heritage project. In July 2017 it awarded grants to help three projects - a Devon Authors' Book Fair at Barnstaple Library (although this application was subsequently withdrawn after the Day was delayed until 2019), to two members of the North Devon Sinfonia representing Britain in an international community festival in South Korea in September 2017, and to the Pilton Church Hall Committee for the creation of a Permanent Bar in Pilton Church Hall. In 2018 it awarded grants to two students at Pilton Community College to help them with their trip to Amigo's Kira Farm Project near Kampala in Uganda during October. The outcome of these latest awards will be posted here in due course. For more details of the 2017 projects go to the the home page of the Pilton Green Man CIO on this website. The CIO also hopes to have access to monies from other grantmaking bodies and companies to expand achievement of the community aims. 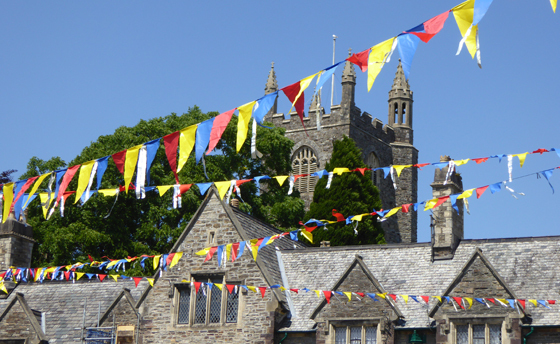 Pilton individuals and community groups are invited to put in requests for funding for small projects which will meet the above charitable aims. The application form for an award, which sets out the terms and conditions to be met, is available on the CIO section of the Pilton Green Man website www.piltonfestival.co.uk. The six trustees of the CIO (as at October 2018) are Marc Brayley (Treasurer), Susan O'Grady, Siobhan Roissetter, Esther Davies, Vernon Clarke and Martin Haddrill. If you would like to be a trustee, please approach one of the existing trustees. * CIO stands for Charitable Incorporated Organisation.